Recurrently researchers analyze experiences and try to draw practical lessons that may be used by other persons engaged in development work, since reality offers positive and negative aspects that planners and decision makers should consider. 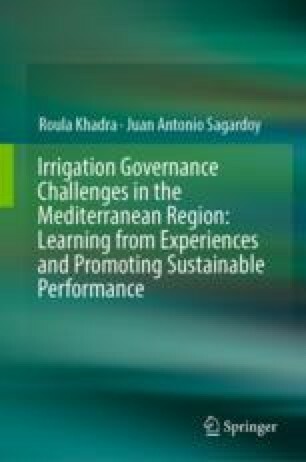 The present publication tries to learn from the experience of a number of selected countries in the Mediterranean Region in the implementation of some major irrigation programs in the last twenty years. For each country, a detailed profile was prepared. In a second phase, the profiles were critically analyzed from the perspective of the implemented irrigation programs, following a set of questions that were previously defined, and the chapters are largely built around the responses that could be drafted. In this way, the readers can consider the range of solutions that other countries have adopted for a similar problem or the approaches that they followed to resolve them. The authors are strong believers that rarely solutions can be extrapolated since each country has its own peculiarities. However, ideas can emerge from what other countries have done and adapted to a specific situation, and the authors hope that, in this sense, this book may be a source of inspiration or guidance to solve some of the difficult problems that the water resources face in the Mediterranean Region.